A two-judge bench today referred the car permit abuse issue to Chief Justice K Sripavan. The decision was taken when the case filed by rights activist Nagananda Kodituwakku came up before Supreme Court today, presided by Justice Priyasath Dep. Kodituwakku filed the case, on grounds that MPs who were granted the car permits were abusing the permit by selling it in the open market, which has resulted in the State losing millions in revenue. In early July, even though the Attorney General informed the Supreme Court that the car permit abuse is not a matter of national importance, the Supreme Court decided to refer the matter to the Chief Justice to consider nomination of a special bench which was taken up today. However, after listening to the activist, the bench decided to postpone the matter for July 25, and referred the issue to Chief Justice K. Sripavan. I hope the CJ will have the guts to call a spade a spade, and take this case on. This openly corrupt transaction should be cancelled forthwith, and the MP’s who benefitted illegally from this should be made to pay the taxes on the deal. Enough is enough!! Adopt the Singapore rule that only educated people can be parliament members and remove our greedy filth? He is a “minority” CJ and has to tread carefully. He has to distinguish between ‘justice’ and ‘what is just’ in this situation. In Sri Lanka, politics overrides justice in special situations. A “Select Committee” is more “powerful” than “common justice” and thus a former CJ was impeached. Moment to shine CJ, Be a hero or zero! Correct this misuse of public money. Stop this practice so nobody can sell their permits. Mr.justice, whether he is `minority` or `majority` CJ we don`t care.What we need is `impartial` justice.Why, this prejudice? Judges also benefit from duty concessionary vehicle permits & it would be a very honest judge with integrity who would dare rock the boat. The biggest incentive for thugs & yobs to be in politics is the car permit & successive govts. have extended this privilege to high ranking govt. officials to keep them quiet, as well as, doctors, thanks to the clout the GMOA wields over the health sector. Yet the question remains – does these privileged people give back to society for what they have been compensated so well? True ‘yahapalanya’ is a fairer society which will be possible only if these unfair privileges & practices are abolished. Certainly, those with responsibility & national importance should be compensated adequately but every citizen should be subjected to a reasonable tax on their income & the same rules should apply to everybody. There should be no privileged class, immune to the law. A good education system, health care & a public transport system can only be funded that way, if not, the rich gets richer exploiting the situation & the gap between the haves & the have nots get wider until there is no middle class left. Nothing is free in developed countries yet the overall standard of living is high. The bottom line is – anything free is not appreciated. Hats off to you Raj!. Absolutely right. Thank you but we should all take our hats off to activists like Nagananda Kodithuwakku. He reminds me of US Automotive Safety Campaigner in the 60s, Ralph Nader, who almost brought down the world’s biggest car manufacturer, General Motors, by highlighting design faults, most famously, of the Chevy Covair. Thanks largely to the lobbying of Nader, manufacturers were forced to take responsibility for their products. It is his legacy that has paved the way for law suits being brought against automobile manufacturers in the US today. Sri Lanka is the only country that I could think of which operates this feudal system. It shows how many centuries we are behind the rest of the world, beyond dark ages. This is mostly the fault of our own voters for allowing Jayawardana’s feudal system to get through at the beginning. Don’t forget it is the UNPers that voted him in and his corrupt system. All successive Presidents and governments, regardless of the color, continued with this abusive system that piled all the privileges on jumping frogs in the Parliament, and made the tax payer carry this enormous burden. Quite honestly we need either the army to intervene and take over the government and clean it up at gun point or if not we need something like people power; the latter of course could end up as anarchy in Libya. We need a strong, patriotic, level headed and wise senior military person to lead the country and its administration until a deserving democratically elected leader emerges. Not any one of the current riff-raff meets the spec. All bath gottas. Can we trust a CJ who had taken the position on the issue of defeated candidates being appointed as MP’s is ‘not a national issue’ to be impartial in giving a judgement on the issue of the abuse of car permits by MP’s is the question? In both the cases it is Right Activist Naganananda Kodituwakku who is the applicant. 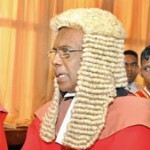 The CJ, poor man must be having recurrent nightmares when it comes to Nagananda Kodituwakku. If[There is a big if!] Naganandas application succeeds,I will eat my shoe! Debates should be conducted in Schools on a National scale,on this issue,so that this becomes an issue of National Importance! CJ Siripavan hates the guts of Nagananda Kodituwakku. 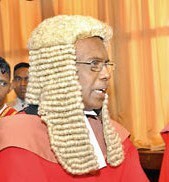 It was CJ Siripavan who started the controversial statement “not of national importance”. Remember what CJ said – the appointment of defeated candidates to parliament using the inherently fraudulent national list scheme is not of ‘national importance’. Why go to the polls at all. Just bribe all parties to put your name up in the national list and hey presto you are a parliamentarian with perks and the supreme gift of a super luxury car permit that can be openly bought and sold. If car permits are given to anyone there should be a reasonable limit to the concession and the person who obtains same must not sell the car for five years after importing and should not use government vehicles during that period. It was under these conditions that permits were originally given. Make hay whilst the sun shine this is the order of the day. In short we can’t correct this corrupt system.